The WiiChuck Adapter is a small PCB that is designed to be inserted into the connector of a Nintendo Wii Nunchuck to provide access to all 4 wires of the remote. The power, ground and two-wire interface of the Nunchuck are all broken out to a 4-pin 0.1" pitch header. Compared with standard WiiChuck, the DFRobot WiiChuck has extra 4 pins which allow you connect it to two devices. 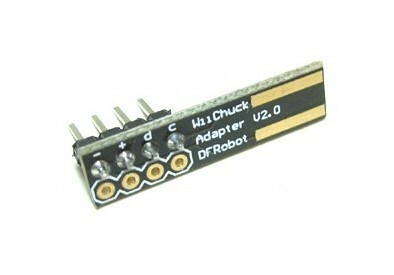 Get WiiChuck Adapter (SKU: DFR0062) from DFRobot Store or DFRobot Distributor.